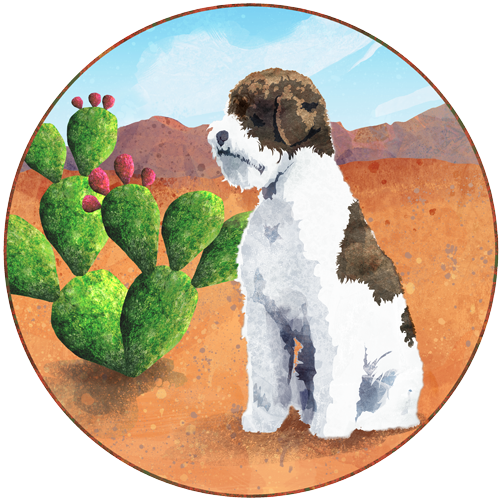 I actually have several graphics I’ve gotten wrapped up and haven’t told you about along the way, and have a portrait of one of my favorite dogs EVER on my table at the moment. Sadly, it’s a memorial portrait, which I still cannot believe. *sigh* Truman was one of the few of my portrait clients that I’ve actually had the honor and joy to know in person. Let’s start with the graphics and illustrations, shall we? After completing two logos for Brian Southwick (the his real estate logo here, and this real estate development logo here), Brian’s wife got in touch with me to work up a logo for her. Also a real estate agent – broker, actually – she wanted something to reflect her own interests in gardening as well as to give a sense of the sophisticated homes she sells, with colors that would work with the identity colors of the company she works for. We kept this very clean and the symbology clear. I have had a lot of fun working with Iola and Penny on this next one. An earlier project they were involved with resulted in some graphics that ended up on the cutting room floor, but which had a lot of support. 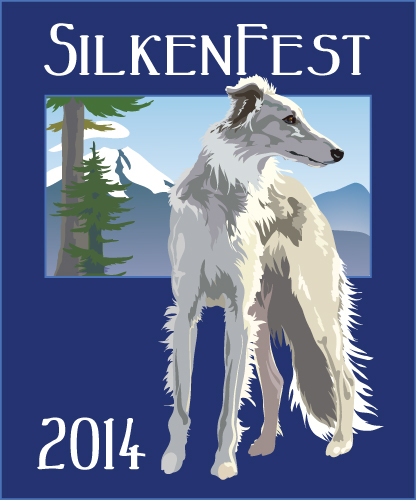 We recycled part of that un-used imagery to create a logo for the 2014 SilkenFest; the big annual event for fanciers of the Silken Windhound. This one has three versions, so far, which can be used in various settings, including a backdrop for photographs of the winners of the various events. 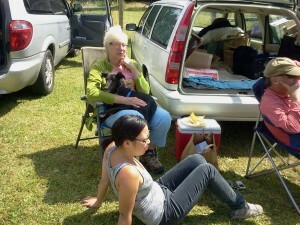 Awhile back, we took a jaunt down to California and stopped in at a tiny dog show in the Sierra foothills. 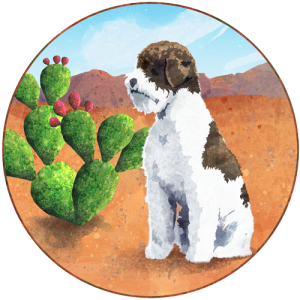 I met a woman who was showing her Lagotto Romagnolos, a breed I’d never run across before. We got to talking, I gave her my card, and we’ve worked on three projects so far. The first was a logo for the Lagotto Club of America, which I talked about here. 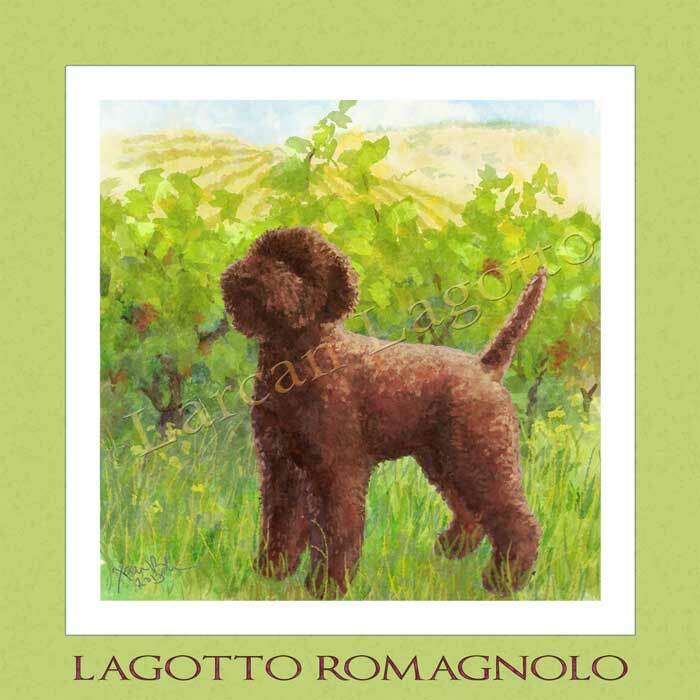 These two are for the Lagotto club specialty; one for the specialty logo, and the other for a custom wine label. I really enjoyed building up a watercolory effect with these two. I tried doing actual watercolors for the wine label, but the learning curve was too steep to get the effects I wanted with the editability we need for logos, so back to Photoshop we went! This one was fun! (I have such nice clients!!) Working from a photo of one of my client’s gorgeous hounds, we played with the wonderful silky fur, and the kennel name (Starfyre), for this treatment. They thought they might even want a black line version as a tattoo (now that’s a lot of like! ), so we also have this version. 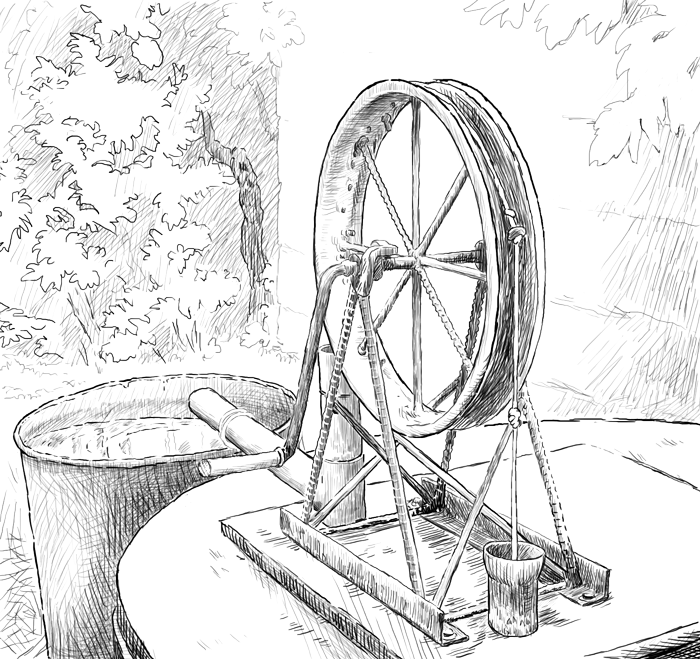 Work continues on my husband’s field guide for water use. I mentioned the cover design here. It’s been enjoyable doing this pen and ink-style drawing. I’m doing the drawings digitally, but they still feel very old-school to me. 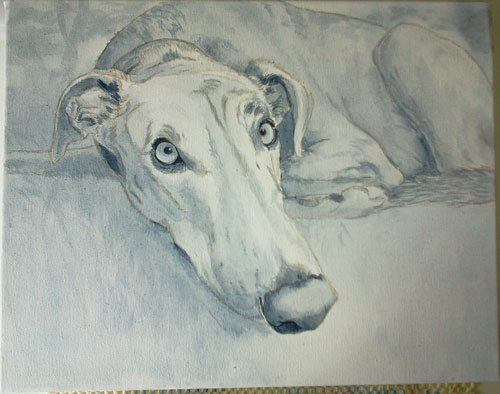 Truman was a big, beautiful greyhound, a blue brindle, which is a coloring that never fails to just make my heart go pitter-pat. Besides being a knock out physically, he was a knock out personality, too. Huge. 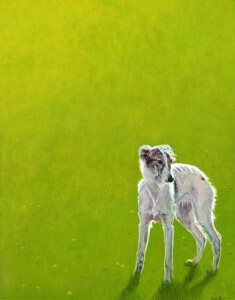 This portrait captures an especially quiet moment, I expect after so much throwing himself around that he was exhausted. 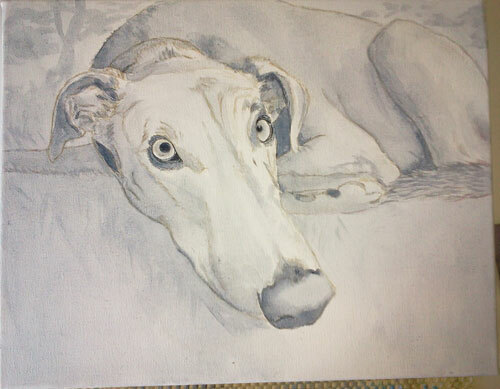 Lying in the grass in the cool shade of summery trees, I want to focus in on his pale amber eyes, that resting-but-ready attentiveness, and of course the classically long greyhound schnozzle. 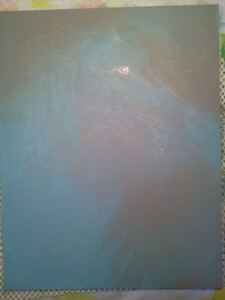 On the left you can see the beginnings of the under painting. I’ve transferred my drawing to the canvas, and have basically nailed down the main elements using my old pal, Payne’s gray. 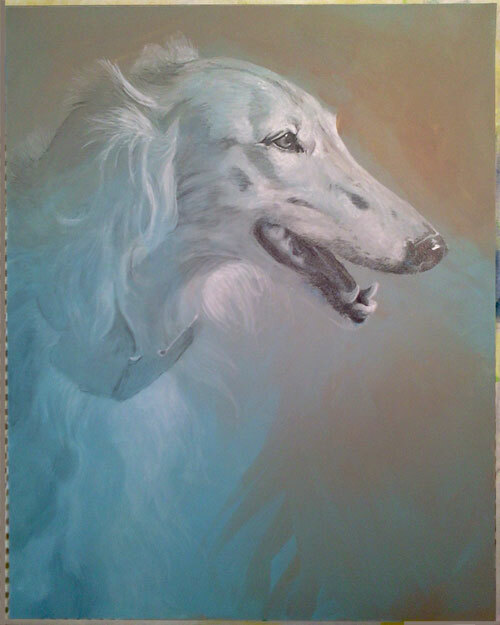 The next steps show the building up of the underpainting, establishing the darker tones, building up what will be almost a full grey-tone painting, to which I will then add the colors. Note that the pupils are a little out of control, and that I have reclaimed them in the next phase below. His spare brindling is also becoming more noticeable, as well as the overall light/dark focus. His face will have the most light, the most contrast, while his body will recede into the shadow a bit, and the background will hold atmospheric light to allow us to feel the sunny day surrounding this quiet moment. So, that’s where I’m at as of today. Always plenty to do, right? (and other breeds, probably) as the characters, maybe some super-hero action, maybe serialized, maybe digital and/or print-on-demand …. Anyone have any thoughts on that? Would you actually buy something like that? 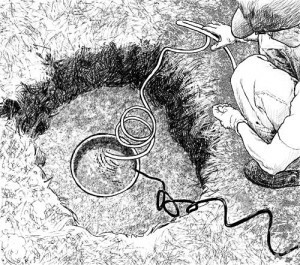 What kind of story-line would be more compelling, to you? I’d love to hear from you! Drop me a comment! We managed to find a great young lady to petsit who I’m not going to tell you any more about in case you all swarm her with requests, and I can never get her again! Suffice it to say, everyone loved her, and all was well. The main point here is that I got H to come with me! YEAY! Everything goes better with the HusbandMan. We packed up the car with all the display stuff, piled on top of an air mattress and bedding, and off we went. We got down to Karen and Paul’s lovely home around 6-ish Saturday evening, greeted by friendly people, and whirling flocks of silken windhounds, adults and youngsters, all enjoying the warm evening and warm hospitality. We pretty quickly felt like part of the on-going party, with puppies mugging us for pets, drinks offered, and conversation zipping comfortably along. It was so nice to put some faces to people and dogs I’d met online, and to see my pal Linda again. We figured we’d better settle on our spot to set up the display, and get the car/our bedroom parked in a relatively flat area out of the way, before it got dark. We chose a spot that was nestled into the shade of trees, flanked by some lovely shrubs, unloaded the stuff off our bed, and eventually inflated it and crawled in on top. Which was amusing. But relatively comfortable, if a bit slantier than we had thought. Which was also amusing. I got some great feedback, and nice chats with lots of people coming over to look at my art, many of whom had watched the development of the recent 3 paintings here on the blog. The painting of Hunter got a lot of attention, but was already sold. Bados’ owner, J, decided to take his portrait home, too. (Bados was there, and in fine form, winning all sorts of things, and looking fabulous!) The little drawing of Silkie that I completed right before we left was also sold before the event, but also got some nice attention. I had a guest book for people to sign and give me some notes about things they’d like to see from me, which turned out to be a great idea. Very useful! 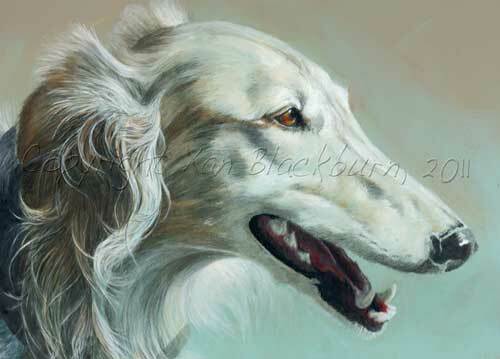 I sold some cards and prints, but didn’t expect to move much of those, since they’re all greyhound related, so it was nice to see some go. 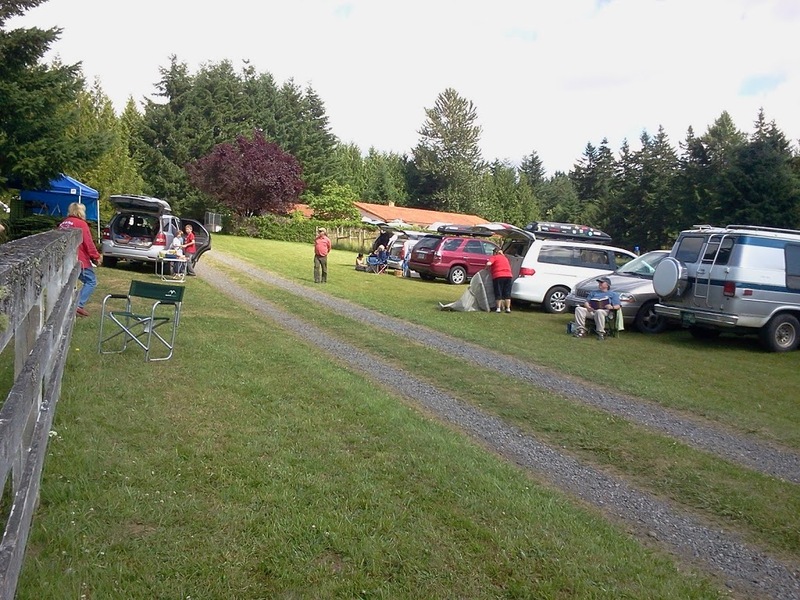 When evening fell, there was an enormous feed, an open bar, and all the flowing dogs and conversation to make the time race towards our bouncy airbed. We slowly woke to the sound of rain on the roof around 3am, which at first seemed just cozy and pleasant … until the lightning started to register, and the fact that my artwork was not exactly rain-proofed started to sink in! We jumped (okay, disentangled ourselves) from the car, and ran up to sort things out more securely, while lightning lashed the sky, and soft rain fell. Once we got our damp selves back under the blankets, we were treated to more light-show, and some quite respectable thunder ’til we finally fell back to sleep. Only to be awakened a little after 6 by a huge explosion of thunder, like another whole car had been dropped on top of ours, followed by a dump truck load of bowling balls. We eventually gave up sleeping, and assembled ourselves for the day. We had found a big natural foods market nearby, sharing a shopping center with a Peet’s Coffee, so we started there. 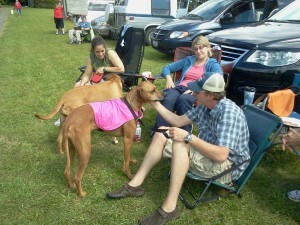 After fortification, we returned to what was meant to be a full day of all-breed lure coursing. 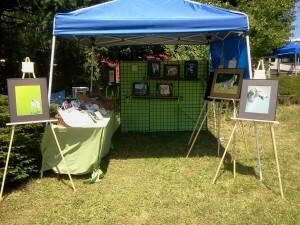 And hopefully selling some artwork. Well, one out of two ain’t bad! I don’t think I sold anything on Monday, but I did make some nice contacts, including a serious interest from the NAKC judge. Maybe more on that in coming posts. 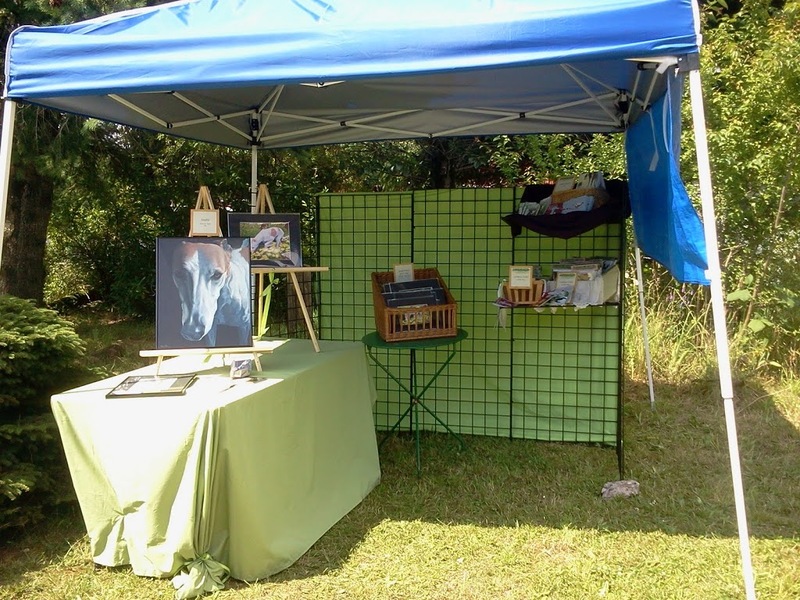 I felt I needed to take my more vulnerable work down because of the damp weather, so my booth got a lot more … efficient looking towards the end. The weather was cooler after the rain, but cleared up nice and warm in the afternoon. New people and dogs started to show up to join the fun. Several strikingly fit whippets, two stately borzoi, and a group of solid and serious-looking Rhodesian Ridgebacks took turns in the various smaller paddocks to stretch their legs and await their turns. The lure machine simply wasn’t cooperating, so there was a lot of waiting, and a lot of work by Paul and crew to try to sort it out. Meanwhile, everyone (except Paul and crew!) just relaxed and shmoozed. 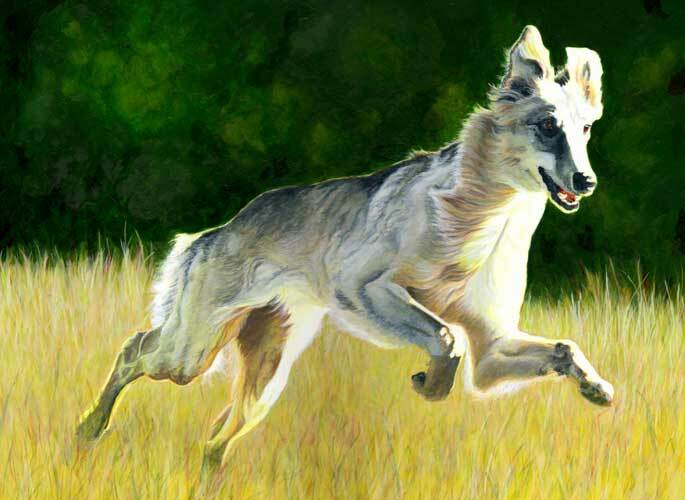 I didn’t take nearly enough pictures, and none of the lure coursing itself, but that’s no loss: they would have just turned out as little colored blots just dashing behind a tree or something. It was fun to watch, though! H enjoyed it so much, he’s talking about setting up a lure course here for our lot. 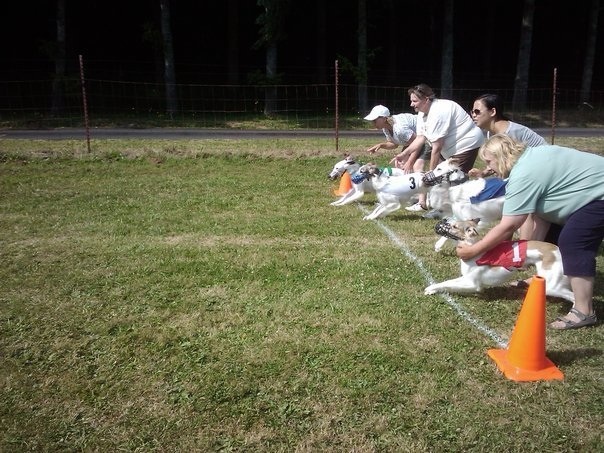 At least a straightaway. All good things must come to an end, and so it was with NWFest. H reminded me we had a pet sitter and pets to get back to. Suddenly in a big rush, we broke down the booth (what was left of it), mashed it all in the car, said our good-byes, and were down the road in record time. SnipFest: Music Festival to benefit WeSnip: Saturday, August 6 · 10:00am – 10:00pm These good people provide low-cost and even free spay and neuter services, and help to capture, neuter and release feral cats. This great benefit event will be a fun day of music and vendors, food, a beer garden, and a police dog demo. I’ll be there! I’m hoping to be able to finish two commissions I have in progress now, just to fluff up my display, before sending them off to their owners. I’ll let you know how that goes over the next few days! A lot of careful work went into refining the silky hairs swirling around the ear and down the neck, bringing them in and out of shadows, giving them dimension, giving them some color, making them finer. Much more shadow was needed along the back of the face, and in the mouth. I couldn’t achieve a deep enough dark for the contrast I wanted in the mouth, so I used mixes of Payne’s Gray, some red, some raw umber, a little Naples yellow in some areas, to give it the depth it needed. The nose and eye also got some of this treatment. I want the focus on the face, with some other interest to set it off, but the exciting busy-ness of the ear had begun to take over the show. These deep shadows brought the balance back. 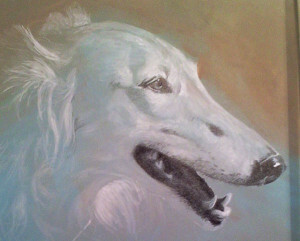 While working on the mouth, I realized I’d gotten a bit off on the lower lip area, between the canine and the big molars. It was not thick enough. Bringing that dark back down where it belonged and marrying it with the areas previously brought almost to a finished state took up some time, but it was worth the effort to get right. Getting the hot and cool reds in the mouth is always interesting. The light may bounce off a wet tongue, leaving a cool highlight, or shine into or through the tongue or edge of gumline, leaving a much warmer color. You can see an almost flame-hot red at the edge of the lower incisors, and an almost blue highlight along the surface of the tongue, curving round to some warmer reds along the near edge, cooling yet again along the gum below the molars. It’s not easy to see in this .jpg, I’m afraid. 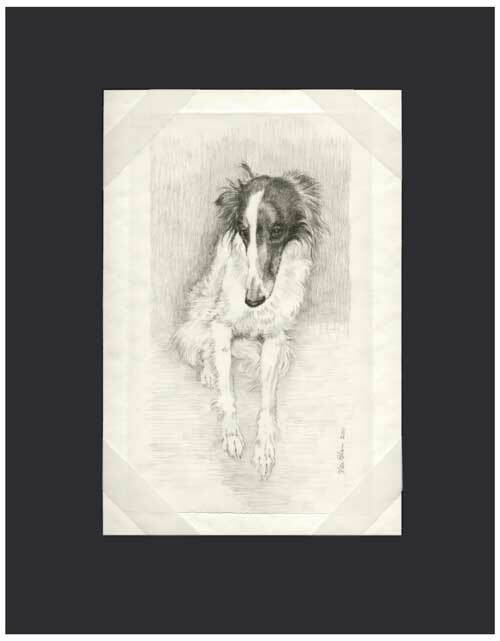 I loved the silky way his fur is streaked with soft gold and pencil-gray. 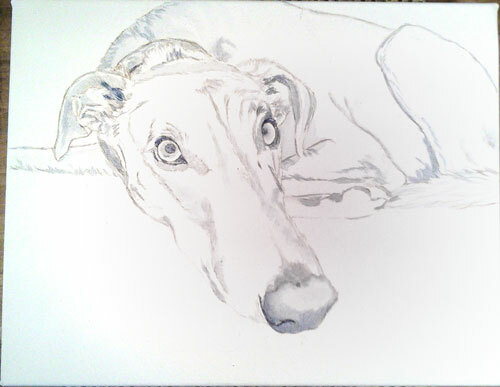 In greyhounds, we call that blue fawn brindle. I’m not sure what that coloring is called for silkens. Anyone? 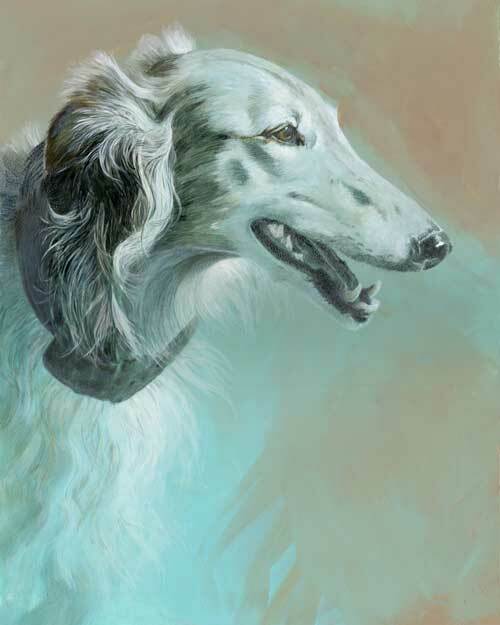 Another difference between greyhounds and silkens is their noses. 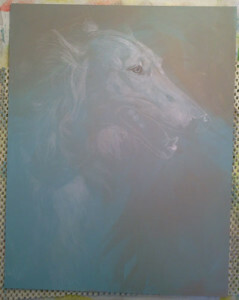 Greyhounds nose leather projects beyond the muzzle a bit, almost like a black clown nose stuck on there for laughs! But, I’d gotten used to it. 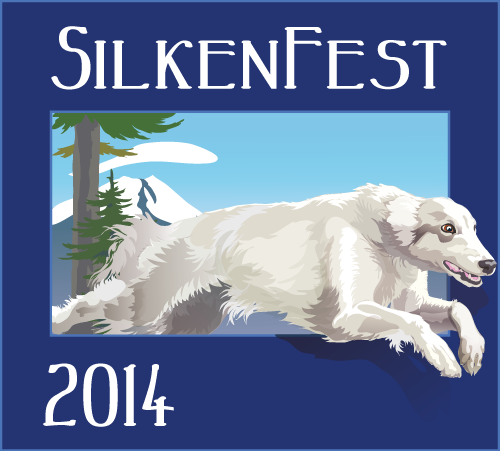 I had to really look and SEE that silkens’ nose leather is more compact, more integrated with the muzzle. That SEEing thing can be so tricky. We assume we know how something looks, and miss the reality, which can throw everything off. Impressionism is all well and good, but the essential points have to click. For me, that is! By around 5pm, I felt pretty well finished with Hunter himself, and took stock of the painting as a whole, and how, or if, I might shift its atmosphere. I wasn’t sure it needed it anymore, now that Hunter’s features were better defined, and his personality was able to assert itself. But, I had a pre-conceived notion, you know! After a traumatic evening, where I tried to take this painting away from the direction it has insisted on from the start, and then had to pull it back from the brink of disaster, I think I’m going to keep my hands off it from now on. I had forgotten my original intent to smudge it up, layer glazes on it, sand through them, and basically give it an aged feel, a sort of lost in time effect. When I tried laying on some translucent glaze, using matte medium and raw sienna (a rich reddish brown), I was already nervous about wrecking it, and over-worked the glaze, resulting in a sticky, funky mess. Much grungier than I had intended! In a near panic, I took a sponge and carefully rubbed off what I could, leaving it just less grungy, but still in an uncontrolled, funky way. I decided I better stop for the evening. I retreated a bit depressed, drained. But not utterly defeated somehow, though I didn’t know what I’d do to fix my mess. I couldn’t resist going and looking at it again later, of course. I remembered I had intended to sand this painting, so I grabbed some fine sandpaper, and started working on the areas I’d goofed up. That helped, but then I went right through the turquoise and brown gesso underpainting in some speckles, so I stopped and left again. When I came back after dinner (a snack, really, as I was too preoccupied to actually cook), I pulled out the gesso I’d mixed and kept separate all this time. It was still wet, so I re-worked the areas I’d sanded, feathering them into the original background the best I could, and left yet again to let it dry. When I looked one last time before bed, I could finally breathe a sigh of relief: it was back to where it had been before the grunge attack! My eyes were aching. I slept like a log (’til about 4:30, but that’s another story!) And here we are today. Tomorrow morning I have an appointment to get these three paintings scanned professionally, in case I want to make reproductions in the future. That gives me one working day (well, half a day now) to maybe do a drawing or something small, perhaps, if I want to get that in on the scanning, too. I’ll need everything to be dry, framed and packed for the trip by Friday, a week and a half off. Plenty to do in the mean time, but I might try to get in a few drawings still. We’ll see! 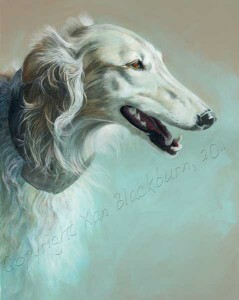 Let me know what you think of Hunter’s portrait, and the others! HUNTER! Yes, his name is Hunter. Christina of New York’s Hunter. The cats are yelling at me for their dinner, so I’ll be brief. Here’s where we are today, with a fair amount to go. As you can see, I spent a lot of time in the ear fringe and mane. I’m mainly happy with this, but I see some saccharine sweetness that may have to be expunged in some way. Motel art is not my goal, here! A dog, and a dog with a name like Hunter, and an athlete like a sighthound, should not just be pretty. My husband said I was expressing the “My Little Pony-ness” of the breed, but that’s not what I want, here! Okay, anyway, the cats are still yelling. I gotta go. Enjoy! Man, I really hope someone guesses who this is, soon! My titles are going to start looking like a math lesson! Today started with some corrections, and some timidity. I got a used Galaxy Tab recently (I might have to give that thing its own post at some point), which has a better camera in it than my phone, which made it convenient enough to choose it over taking multiple stage scans at every little stage. It also has a nice little display (7″) which I can zoom in on, etc., which makes it a great reference tool. Usually, I print out my reference photo, and have that on my work table while I paint. But, my printer isn’t the greatest, and, looking at the Tab’s version next to the printer’s version showed me a LOT that I had missed or misinterpreted. All that might have been okay, for the purposes of this portrait, but once I had the better picture, I had to work from that! I had gotten a sort of uniform darkness in the mouth that wasn’t right. I had tried to correct it yesterday, but wasn’t happy with that, either. The graphite just would NOT come off the board in the usual way (kneaded eraser, Blu Tack) or the unusual ways (sanding, cursing). I had dabbed some of the background paint I had kept, but that needed to be smoothed and re-integrated into the whole. This morning, I decided to return to the Blu Tack. That’s great stuff for pencil work! As it’s actually adhesive, without forming any residue, it picks up the graphite dust rather than spreading it around or rubbing it off. I made my little wad about the right size, and rolled it repeatedly over the mouth area, re-kneading and re-wadding as necessary to keep a clean surface. It eventually picked up enough so that I could work back in the shading I wanted. Yeay! Now to conquer my timidity! It’s looking so cool the way it is that I was afraid to mess it up, and intimidated by how much work there is still to go to reach my original idea. I started pecking away with my pencils, taking frequent breaks to compare hardness on various other surfaces, sharpen them, step back and squint, check my reference again …. I realized I wasn’t going to get anywhere like that, so I decided to try using a stump (a blending tool made from soft paper, rolled tightly and with a conical tip on each end) to very softly smudge in some areas of shadow, get me over the hump of treading on all that freshly fallen snow before me. That helped. 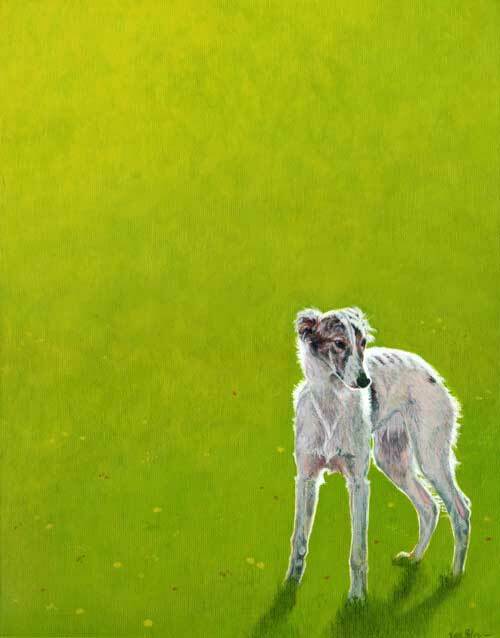 Then I decided I needed a broader stroke, to block in large areas where shadows were deepest. Using the matte medium I bought yesterday, to keep (hopefully!) 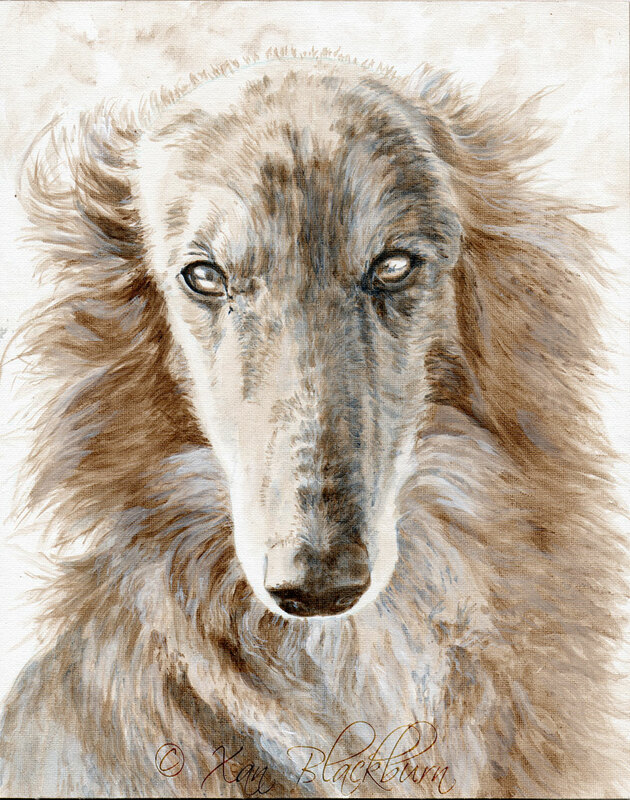 enough texture to the surface that I can still draw on it, I diluted a mix of payne’s grey and burnt umber, leaning towards the warm umber, to wash in some shadows along the back of the face, under the chin, and behind the ear fringe. Very light washes, since I’m still feeling timid, and I don’t want to commit to too much, nor take away from the pencil work I’m still intending to do there. All that is in the first picture above. Another look at my reference and I realize I’ve foggily edited out the back of the ear, where it lays against the neck (it’s completely shadowed out in my printed reference!) 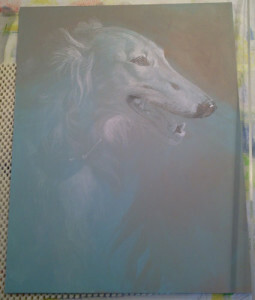 Trying to decide whether to work it in, or leave it all softly shadowy and vague back there, I look closely at the reference photo, and see all these lovely internal shadows and highlights within that area, including the edge of the ear. I decide to do it. I guess I took this photo when the paint was still damp enough to glare. That’s a bummer. Well, at least you can see the back of the ear, and how I’ve worked in some of that tawny red tone around and into the eye as well. I also used that color, mixed with white, to add some warm color to the teeth, and warmed up some of the highlights elsewhere as well. Now the molars are too light, but that’s easy to remedy. Okay! Between lunch, making this post, taking the dogs out one at a time *sigh* and answering the intervening emails, it’s now quarter to three! Back to painting! 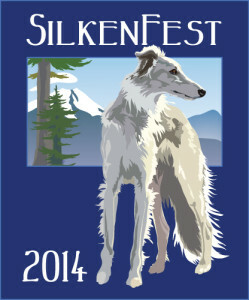 Well, it’s still a silken windhound, but I’m working on this one really differently. I figured I’d better write this down before I forgot what I did, and what my original thought is, so here goes. I wanted to combine a graphite drawing with acrylic. My original concept is a little vague, since I’ve never done this before, but it involves layers of paint, pencil, sanding, glaze, more sanding, more paint, more pencil, more of all the above …. Sort of the lasagna approach, if you will. I did a couple little sample bits, just to work out the way that might end up looking (which I will not show you! ), and then decided to jump right in. I chose my subject as a head-only portrait. (Any guesses who this is?) Working on an 11 x 14 gessoed panel, I started with some acrylic gesso, mixed with blues, burnt umber, and Naples Yellow, keeping the blues where the dog would go, more or less, and the warmer tones around it, loose and vague. I’m not at all sure how much of that will show in the end, but that’s the first layer. I chose to use the gesso because I want the surface to still have some more tooth than straight acrylics; more like a chalkboard than the side of a water bottle. I transferred the drawing, using white transfer paper (like carbon paper, but leaves white marks), and keeping it pretty simple. I didn’t want the transfer to interfere with my pencil later, just give me some key locations to work from. In this first pic, you can sort of see the drawing in places, and the glowy eye is actually where I started working in some pencil, which made a glare. Sorry! I got the eye established a bit before I realized I might really want to get in those white areas first. I’m really flying by the seat of my pants, here! Just in case, I started working on the highlights. I’m already liking the feel of this, and I hope I have the courage to do the experimental stuff to it when the time comes! Here you can see I’ve got the whites fairly well placed, but only in a ghosty sort of way. I wanted to work in the pencil some more, starting in the face. Sorry about the shadows running down the side there. That’s my hand rest thingy, to keep me from sludging my hand or sleeve through my work. I made it myself! Anyhow, this is still pretty subtle, but it’s got a very ethereal feel to it that I like. Let’s take a closer look at the face. I had several days away from my artwork, what with the holiday, a family visit, and a sudden panic that I wouldn’t have the stuff I need for the event (frames, mat board, a way to display my prints, a way to take credit cards in case my fancy new [used] device doesn’t work …), so it’s good to be back to it! I think my original idea of how much stuff I’d be bringing was ambitious, but I’m getting to be okay with what I will have, so there you go. 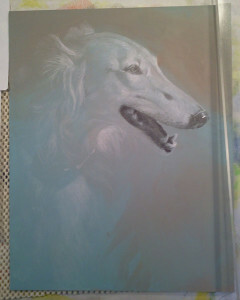 Any guesses who this elegant hound might be, from what you can see so far?